Last Updated: March 3, 2016 | Subscribe to our weekly newsletter! Every hot tub owner has heard about the risks of Legionnaires’ disease. This disease can be serious if not treated immediately. Many find this prospect rather scary and often close their hot tubs due to their fear. However, despite the seriousness of the disease, you can easily guard against the disease in your hot tub by simply keeping an eye on your water and making sure that your hot tub is as clean as it possibly can. First, let’s take a look at what this disease is and why the bacteria that causes it like hot tubs so much. Then, we can take a closer look at exactly how you can prevent these bacteria from opening up shop in your hot tub. Legionnaires’ disease is a type of severe pneumonia caused by a germ known as Legionella. This disease has been known to cause death in patients but can’t be transferred person to person. In most cases people contract this disease by inhaling the bacteria. Each year between 8,000 – 18,000 people in the United States contract the disease. In most cases the disease can easily be treated with antibiotics, but if left untreated it can be fatal and even after successful treatment some patients continue to suffer from complications of the disease. Legionella is found naturally in water, and it especially loves warm water. Because this, a hot tub can often be the perfect breeding ground for this bacteria. Because the bacteria that causes Legionnaires’ disease loves hot water, hot tubs everywhere are the perfect breeding ground for these pesky microscopic germs. 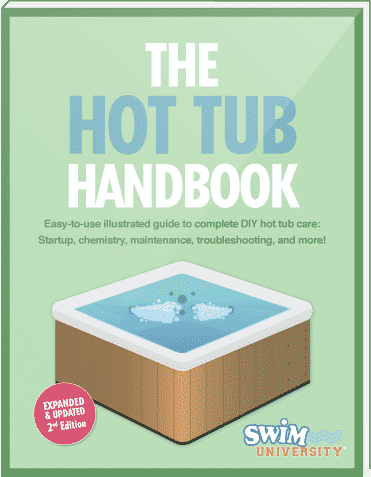 Dirty hot tubs can quickly become contaminated with the bacteria, and because it is more difficult to maintain proper disinfectant levels in the warm water of a hot tub, it can easily happen to almost any hot tub owner. As I already said, the disease cannot be transmitted from person to person, and you won’t get it by being in the hot tub. In most cases, the way you contract the disease is by inhaling the steam while you are soaking in your hot tub. This aerosolizes the bacteria and makes it very easy for it to make its way into your lungs infecting them with the disease. First, if you own a hot tub or you are considering buying one, don’t let this frighten you. Remember, the disease is treatable if you do get it. But, with just a little proper care of your hot tub, you won’t ever have to worry about it. Your disinfectant such as chlorine that you use in your hot tub has a tendency to break down faster in the warm water. That means it is very important for you to keep plenty of it on hand and regularly test your hot tub’s water to make sure you have enough in your spa. Go ahead and pick up a good supply of test kits for your hot tub and regularly test your water. If you use your hot tub very often, I recommend you test it once a day or, at the very least, a few times a week. If your hot tub sits unused for an extended period of time, make sure you test the water and adjust your chemicals before you get in it. In addition to making sure your chlorine levels are where they should be at all times, you should also take the extra time to drain your hot tub and clean it thoroughly. For regular usage, I recommend draining your hot tub and cleaning it at least once every 3 months. If your hot tub is used heavily, you may need to clean it more often. By taking the extra time to properly clean your hot tub, its filters and, of course, regularly checking the disinfectant levels in your water, you can prevent the bacteria from growing in your water and eliminate the chances of getting the disease completely. Many hot tub owners worry about Legionnaires’ disease in their spas. After all, no one wants to get their friends and families sick. However, don’t ever believe that you shouldn’t use your hot tub anymore simply because there is a risk of contracting this illness. The truth is your chances are very low and you are more at risk in public hot tubs than your own personal hot tub. Still, if you want to make sure you never have to worry about it, just make sure your hot tub is clean and your water is in tip top shape at all times. Regularly check your disinfectant levels in your hot tub and always make sure your water is in perfect balance. If you do that, the bacteria won’t stand a chance and you can enjoy a safe and warm soak whenever you want.